Coding is great fun. You can make useful and great apps for your operating system if you can learn well how to do coding. 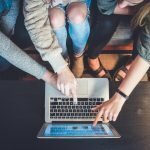 To be a great applications developer, you have to know about all the details of coding or programming in various applications. There are various types of code editors or text editors or HTML editors for several operating systems which are available to make your coding capability easy and quick, while some of them have worked great across the OS. To create new software in Linux, there are lots of Linux code editor available out there; those can make you an expert Linux code developer. IDEs (Integrated Development Environment) or code editors are amazing and great for building new program or apps with tons of handy features. We are here to make a list of the top 10 best Linux code editors, which come to us with such features like, auto-complete tags, and classes, plugins to have extra capabilities, and even the bits and pieces of code without having to type it. 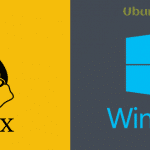 Here we are coming with the best 10 Linux Code Editors with their review and comparison. These 10 are the best and most popular Linux Text Editor with distinctive features for the Linux operating system. Atom is a Linux code editor that is smart, trendy, approachable, and yet customizable to the core. This excellent Linux text editor offers you to customize it to do anything you want. With cross-platform editing features, built-in package manager, smart and modern autocompletion tags feature and file system browser; this one denotes as one of the best code editors for Linux. It also supports multiple panes and finds and replace function. 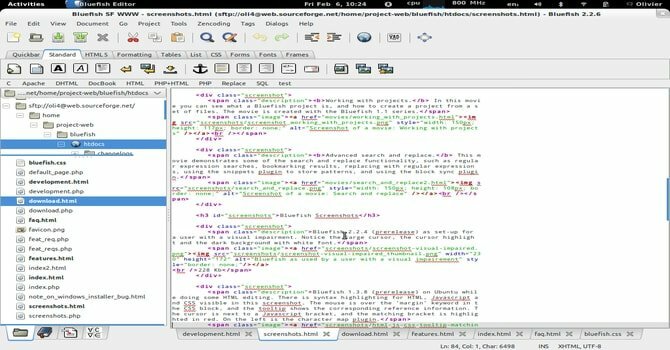 Brackets Linux HTML editor has many great features such as cross-platform editing, live preview, inline editors, and preprocessor support; SCSS and LESS. This Linux HTML editor has some great extensions support including Emmet, Indent Guides, W3C Validation, etc. Sublime Text 3 for Ubuntu is an amazing text editor for coding, markup, and style. Sublime Text Editor allows for code highlighting and better presentation. It also has a custom regex engine that significantly speeds up file indexing and loading. The command palette feature of sublime code editor offers access to frequently used features like sorting, changing the arrangement and changing the indentation settings. Sublime Text is highly customizable. You can customize everything with simple JSON files such as Menus, Macros, Key Bindings, Snippets, Completions, etc. Vim is one of the most successful and best code editors of UNIX. Vim is most likely same as the Vi, but it has better features than it. 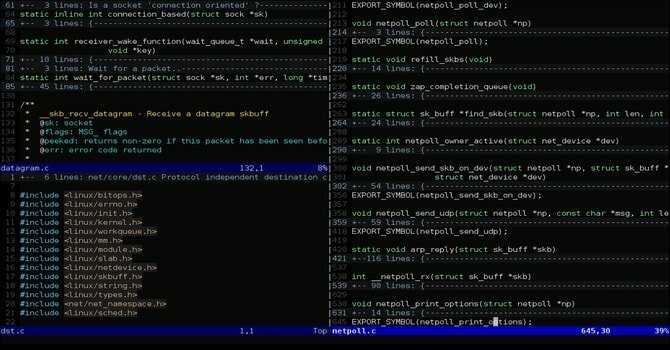 Vim is a highly customizable Linux text editor, built to create and change any kind of text very effectively. You can edit or create your Linux software with this easily. This Linux code editor also supports multiple plugins and hundreds of old and modern file formats and programming languages. Gedit is an Integrated Development Environment (IDE), which comes preinstalled as the default code editor for the GNOME desktop environment on Linux. This Linux text editor is created for the general purpose and aims at efficiency and simplicity. Gedit has come into the light on 2000; first release, while it is written in C programming language. If you are a newbie in the world of Linux web developer, then Bluefish Linux code editor can be a great choice. Bluefish is a code editor that designed for various operating systems like Linux, Mac-OS, Windows, Solaris and other Linux distros. This best Linux HTML editor offers some great and advanced features such as support of integration of external programs, auto-completion of tags and classes, auto-indentation, installing additional plug-ins, etc. 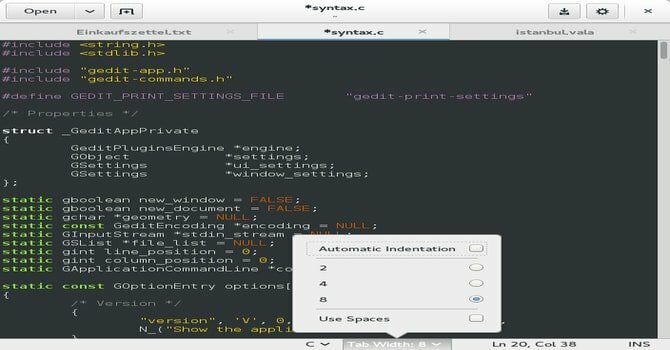 This Linux code editor has a neat and clean, lightweight graphical user interface which is very useful for the beginners to start coding on Linux. Unlike other best code editors of Linux, it also supports multiple external programs such as Lint, Web-lint, XML-lint, Javac, Tidy. One very important feature of this fantastic code editor is auto-recoverer the data after certain system crash or shutdown. This code editor for Linux has some great and useful features like refactoring, source control plugins, code navigation, etc. It supports RAD (Rapid Application Development) Tool, LLDB Next Generation Debugger, several compilers, shows errors as code glossary and much more. 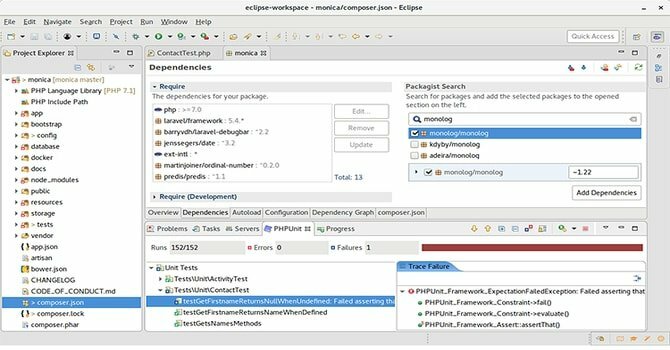 Eclipse is one of the best open-source, cross-platform Linux code editors in today’s programming world. This widely used IDE offers its users a great GUI with support for drag and drops functionality for easy and quick composition of UI elements. With source navigation, Eclipse also supports for syntax highlighting. This app provides several knowledge tools including Call-graph, Type-hierarchy, Built-in Browser, etc. It supports folding and hyperlink navigation. 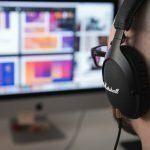 Users can make a project and edit later on easily. 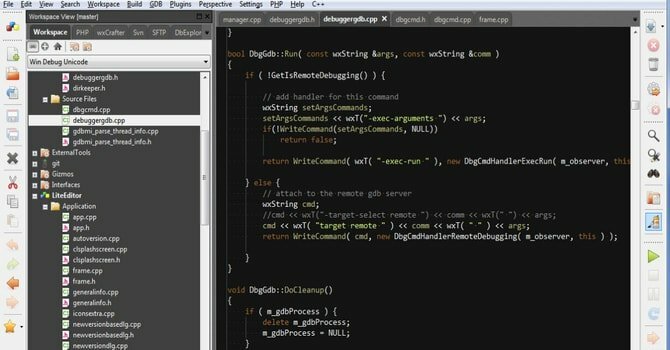 Visual debugging is also possible with this amazing code editor. 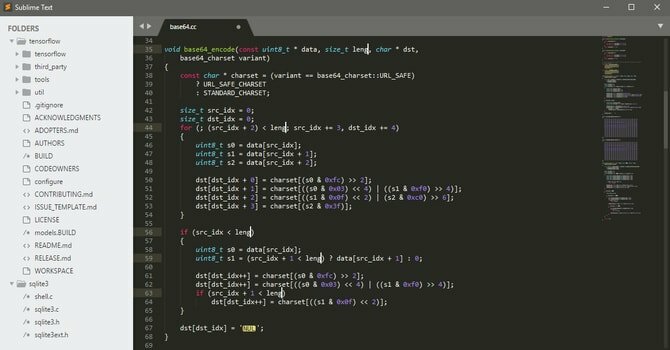 Code::Blocks is free but highly customizable and extensible, cross-platform code editor that offers the most demanded and ideal features. For its consistent UI, it has become one of the most renowned C++ code editors for all the major platform. The most important feature of this code editor is that it permits users to use various plugins easily both written by Code::Blocks and individual developers. 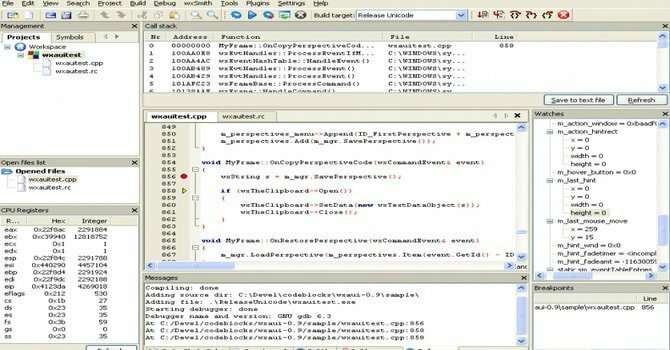 This Linux code editor loads the file fast and smoothly. It supports several compilers including GCC, C++ 5.5, Clang, Borland, etc. There are many great features of this Linux code editor including multi-target projects, workspace support, display local functions symbols, syntax highlighting, custom memory dump and much more. Geany is a great IDE that used for the GTK+ tool-kit integration to provide an excellent development environment. If you are searching for a Linux code editor that works more like an IDE, Geany could be the perfect one for your system. This lightweight code editor for Linux supports all the major and modern programming languages with fewer dependencies from other combinations. The key features of Geany are a pluggable and configurable user interface, syntax highlighting, line numbering, etc. While it has a simple UI and plenty of configurable features, the developers had written it in C and C++ programming language. You can do a lot more task with this great Linux code editor including auto-completion tags, code navigation, code folding, symbol listing, project management, etc. Now I am including Visual studio code editor in this top list as an honorable mention. After publishing this piece of content, many users have sent me a request to include this code editor. So the question may come, why I didn’t include this one while publishing the content? The answer is, like many other Linux users, I also don’t like Microsoft programs as they don’t support open source application development. But it seems that this time the thing has been changed with Microsoft and now they are supporting many open source software developments including this one. So why do I leave something that offers great help for open source developer? 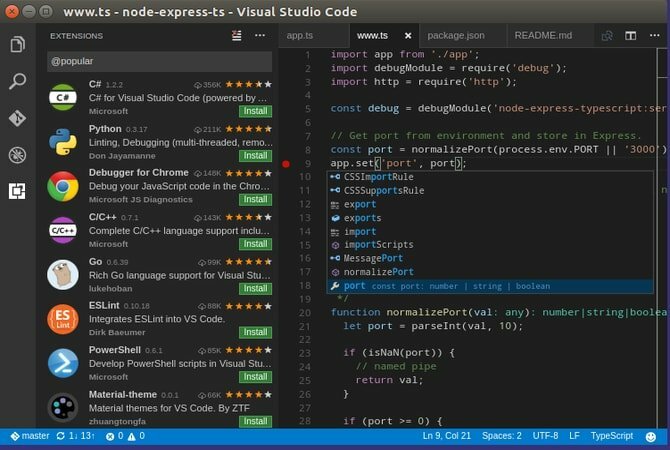 Visual Studio Code is completely open source code editing software for Linux. And frankly telling, it has lots of amazing and effective features which help both the newbie and advanced developer to create and maintain the project efficiently. This app is lightweight and good for web development. Mainly it supports auto-completion and useful hints while coding, built-in extension managers, integrated Terminal, debugging tools, and overall offers an easy way to code in a huge number of programming languages. Now I can’t say which one is the best Linux code editor because it depends on how a user uses it for his/her certain task. I recommend you to justify all the features of the code editors for Linux and compare and find which one helps you to complete your requirements. We consider there features and ease of use to rate them and pick them in our top pick list. Yes, I’ve hardly ever touch __GaNooooU__/emacs, but it surely should make the list. …which I currently use as my daily. 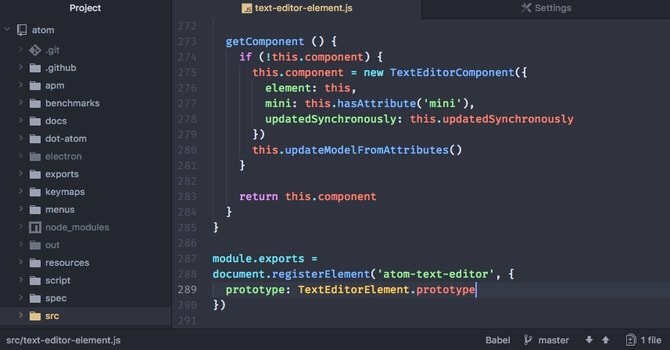 Thanks for sharing this cool code editor well, I like atom and I wanted to know which theme you have integrated in an atom. Keep doing good work. You just missed the best, most known to experts and most flexible Editor: Emacs. Especially if you use it with the awesome spacemacs distribution, which fuses emacs and vim. So this activity looks a bit silly. Emacs doesn’t hold a candle to VIM. Emacs users are just delusional. I’m yet to see emacs users to go to vim ….. From this you an conclude that only thing that is keeping people with vim is its keybinding and not its features …. but I guess we all know saying …. Emacs can do everything Vim can but reverse isn’t true …. If Eclipse is here, where is Netbeans? why do you add unofficial repositories when some of them are already in the Ubuntu repository? Thanks for the comment. Please let me know the exact app with official repositories. I will be updating the content as soon as possible.